"We are disturbed by the notion that Young would prefer to stay in favor with the Republicans rather than take a stand on an issue that will affect generations. Other incumbents have stood by their votes and decisions, even when they are not popular. Hoffmann... will work with Republicans and Democrats. This promise is important on the town level as the Wilzig controversy comes to an end and is needed on the county level as well. 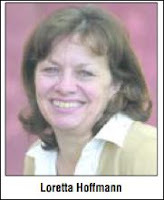 Therefore we encourage Taghkanic residents to elect Loretta Hoffmann as their next town supervisor."